Radisson Hotel Salt Lake City Airport provides comfort and convenience just three miles from Salt Lake City International Airport (SLC). Whether you’re flying in for vacation, business travel or a sporting event, you can ride our free 24-hour shuttle to and from the SLC airport. When you’re ready to visit attractions like Temple Square, the TRAX light rail station is just a five-minute walk from the hotel. Visiting for a tournament? Our Team Winner Program offers perks like one complimentary room per every 20 occupied and a free sports drink for each player. Here for work? Corporate travelers can upgrade to the Business Class Room for a complimentary breakfast and vouchers for complimentary drinks. The Sapphire Grill is your dining destination at the Radisson. Whether you sit down for the breakfast buffet, a casual lunch or a dinner reservation, our chef’s signature takes on American classics appeal to both the eye and the appetite. Save room for a specialty dessert after your surf-and-turf entrée, or relax in the lounge as you sip a cocktail from the bar. You can mingle at our Manager’s Social Monday through Friday evenings, or order room service when you prefer to relax in your room. Temple Square – There’s a lot to see and learn in this 10-acre square just three miles from the hotel. Listen to the sublime voices of the Mormon Tabernacle Choir, walk the grounds of the Salt Lake Temple and tour the Beehive House, home of American Latter-day Saints leader Brigham Young. Red Butte Garden – For those who enjoy simply being outside, this botanical garden, arboretum and amphitheater offer the ideal venue only eight miles from the hotel. Get your tickets, and pack a picnic for the summer concert series at the Amphitheatre. Vivint Smart Home Arena – About three miles from the hotel, this 20,000-seat indoor arena shakes with the cheers of Utah Jazz fans during NBA basketball season. You can also catch big-name performers like Brad Paisley and Pink at concerts throughout the year. 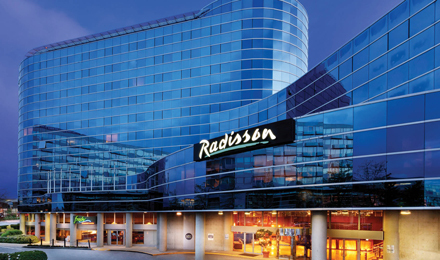 One of the city’s most popular spots for groups, the Radisson offers discounted room rates through the Motorcoach Program. Here for a conference? The hotel also provides convenient services like a free airport and convention center shuttle for corporate travelers who are flying in for meetings. With on-site catering, free parking and two meeting spaces that accommodate up to 65 attendees, our hotel is sure to leave a great impression on your event attendees. Relax with free Wi-Fi in your spacious hotel roomLess than 10 minutes from the Salt Lake City Airport, the 125 rooms and suites at the Radisson are designed for your comfort and convenience, with free Wi-Fi and a plush pillowtop bed. Finish up presentation details at the work desk, or spend the evening watching DirecTV. When you’re thirsty, enjoy a complimentary bottle of water, brew a hot cup of coffee in your coffeemaker, or grab a beverage of your own from the in-room refrigerator. Ideal for couples and solo travelers, these rooms have your choice of a king bed or two queen beds and standard amenities such as free Wi-Fi. These rooms are specially designed for corporate travelers. Take advantage of access to upgraded amenities, services and benefits that help you work more efficiently. Featuring a king-size bed with a pillowtop mattress and a separate seating area with a sleeper sofa, our Suites allow you to have overnight guests or spread out as much as you’d like. Choose The Sapphire Grill for surf-and-turf favoritesAfter a long flight to Salt Lake City International Airport, satisfy your hunger at The Sapphire Grill, our on-site restaurant and lounge at the Radisson. You can find succulent seafood, tender steaks and other American classics, as well as signature desserts that are sure to satisfy your sweet tooth. The Sapphire Grill is also a great place to meet up with friends and colleagues, offering plenty of beer, wine and cocktail options. For a quiet night in, room service can deliver the same great meals right to your door.